The formula for casual style? 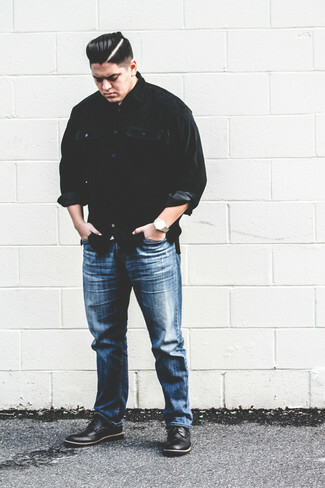 A navy shirt jacket with blue skinny jeans. Introduce Dune Lace Up Brogue Boots In Black from Asos to this ensemble to kick things up to the next level. 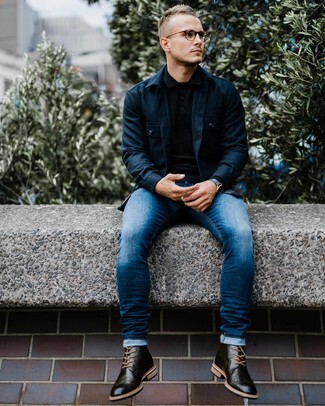 We're all looking for comfort when it comes to dressing up, and this combination of a navy fishtail parka and navy skinny jeans is a wonderful example of that. Got bored with this getup? Enter Dune lace up brogue boots in black to change things up a bit. Contrary to what you might believe, outfiting dapper doesn't take that much work. 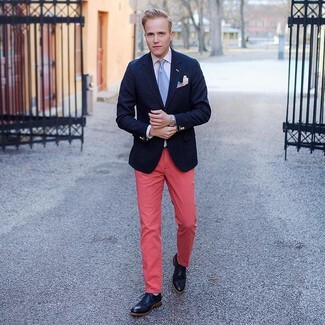 Just try pairing a navy blazer with hot pink chinos and you'll look amazing. 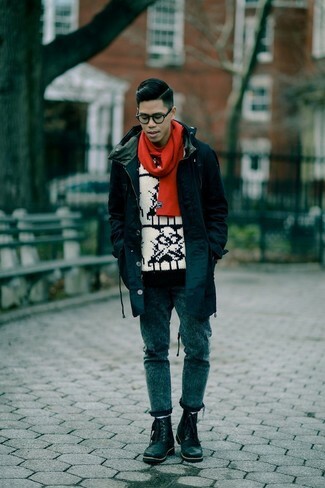 When it comes to footwear, this look pairs really well with Dune lace up brogue boots in black. 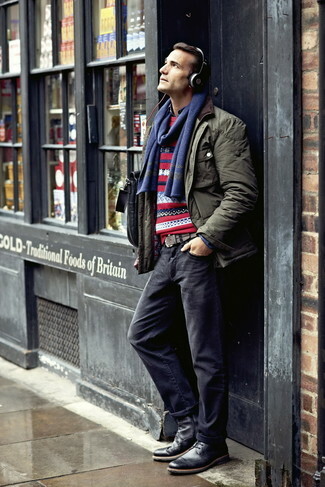 If you're looking for a casual yet seriously stylish outfit, opt for an olive field jacket and navy jeans. Both items are very comfortable and will look fabulous when paired together. Wearing a pair of Dune lace up brogue boots in black is a simple way to add extra flair to your look. 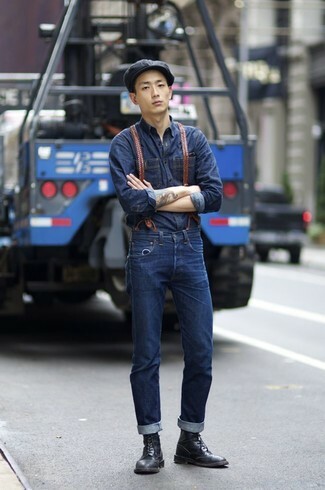 If you're on a mission for a casual yet sharp getup, dress in a black corduroy long sleeve shirt and blue jeans. These two pieces are super comfy and look amazing when worn together. To add elegance to your outfit, complete with black leather brogue boots. 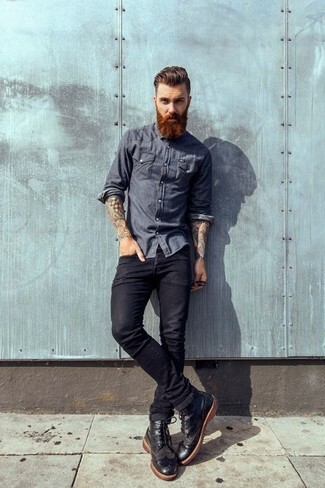 If you're on the hunt for a casual yet stylish getup, go for a navy chambray long sleeve shirt and black jeans. These two garments are very comfortable and will look stunning when worn together. Turn your sartorial beast mode on and opt for a pair of Dune lace up brogue boots in black. 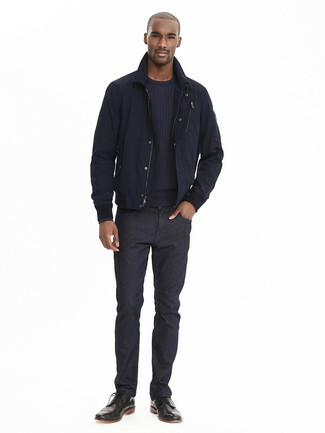 If you're in search of a casual yet sharp outfit, consider pairing a navy bomber jacket with black jeans. These two items are totally comfy and look great paired together. You could perhaps get a little creative when it comes to footwear and spruce up your look with black leather brogue boots. If you're hunting for a casual yet sharp outfit, go for a navy denim shirt and navy jeans. These pieces are super comfy and look great when paired together. 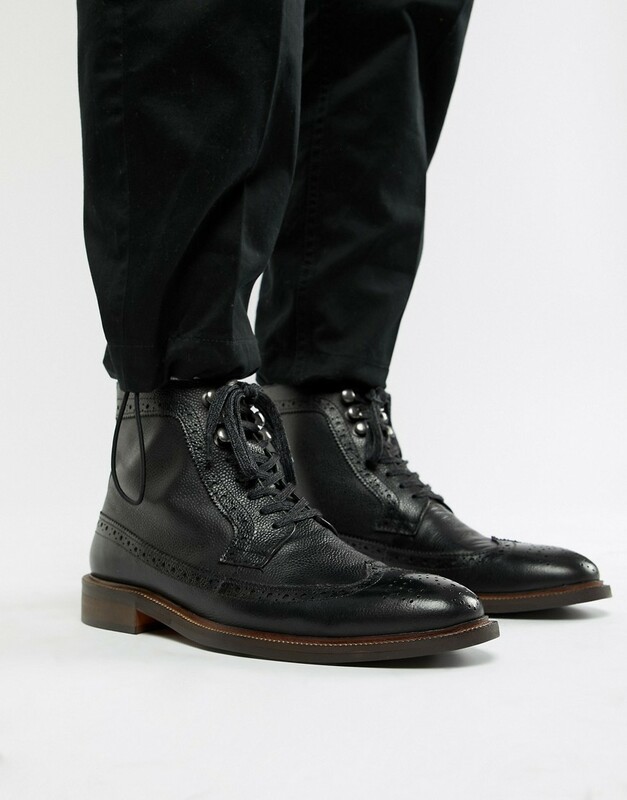 Kick up the cool of your outfit by rounding it off with black leather brogue boots. For a nothing less than incredibly stylish getup, consider pairing a black overcoat with black dress pants. Dune lace up brogue boots in black will add a more relaxed feel to your look.